Things have been slow in my sewing dungeon this week. At least since I finished graceful Baltimore. On Saturday the 7th I went to a friends place to teach her to piece. I chose a simple placemat pattern called String of diamonds by Canuk Quilter Designs (click to link). I found it on Craftsy as a free pattern. 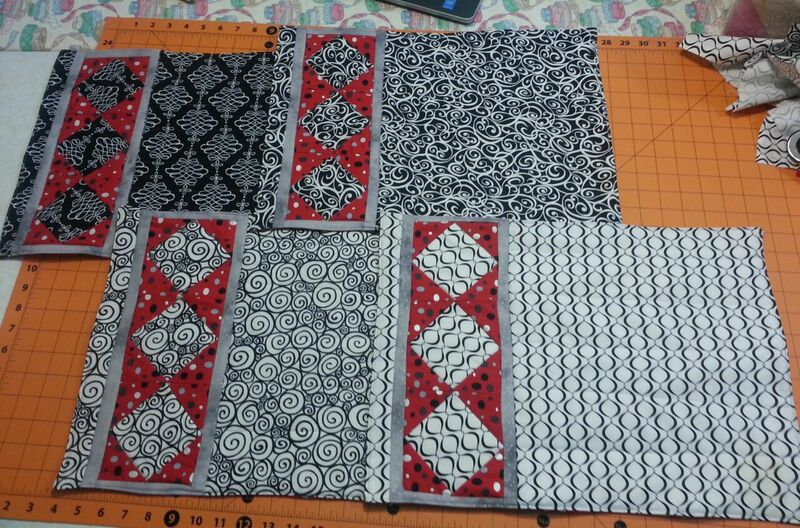 This was an easy to teach simple square in a square block and no binding just flip over edging. I find that placemats are the perfect item to teach a beginner as by the time they finish the 4th they usually have all that was taught down pat and reinforced by repetition. I did get a text can you please make a video on how you measured using those 2 rulers. The block was 13×14 and we were using 6×24 rullers so we had to measure then place the extra ruler against the measurement to cut. Here is a link to that you tube video. Cutting larger pieces than your rulers. Today while I was visiting she mentioned that she wanted a runner for her Kitchen counter so I came home and whipped up a runner for her. This is the String of Diamonds Runner (click to link) also as a free pattern. I just added 4″ on each side to make it wider. Next with the left overs I will make her pot holders using the square in a square pattern and oven mits ( I found a simple tutorial from Cindy at Skip to my Lou Blog) (click to link). This should give my girl a good start to decorating her new home. Previous A Graceful Baltimore…Quilting makes it.